Half Moon’s 18-hole par-72 championship golf course is acclaimed by industry experts and amateur golfers alike. The course was designed by the legendary Robert Trent Jones Sr. and modernised by Robert Rulewich, creating a masterpiece of sheer beauty and game-raising challenges. 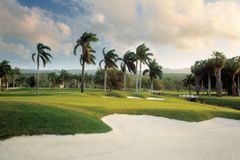 PGA tournaments also have been held at Half Moon, including the European PGA Senior Tour, and since 2007 the Jamaica Open. Just four minutes away from the Half Moon Golf Course, are the White Witch and Cinnamon Hill courses, making Half Moon an ideal golfing destination.